Activities in care homes started when someone realised one day that only providing care and a comfortable place to live, doesn’t necessarily lead to a meaningful life. I assume the first attempts at running activities involved chatting with the older residents, putting some music on, singing along and maybe playing cards. Soon, care home managers, health care professionals and the government realised that it’s mandatory to run activities for older people and individuals with disabilities. The first bubbly and fun carers became activities coordinators and shortly after that, they started running simple activities such as using colouring books, playing with board games and softballs. It took a few more years still for specialists to understand that singing, “We’ll Meet Again” and playing bingo might be fun but this doesn’t mean that it’s meaningful. However, even if we did assume it was meaningful, these activities wouldn’t benefit clients with more advanced needs such as severe dementia. After the establishment of activities in care homes and healthcare organisations, I imagine people started exploring the therapeutic aspect of the arts, and this resulted in many universities providing new programmes around art, music, drama and dance therapy. The more progressive healthcare organisations started recruiting professional art therapists in order to improve the quality of their services. Soon, technology broke through and this also became a useful tool to interact with older and disabled people and now here we are in 2018, with many organisations specialising in providing fancy artistic projects to healthcare organisations – with iPads, short films, sculpting, photography exhibitions and so on. Although the variety of activities is probably larger than in the past, this doesn’t necessarily mean that the quality of the activities is better! Sometimes we are led to believe that projects such as a ten minute theatre performance by amateur actors with dementia is successful, but this may not be the case as an unusual and sophisticated art project doesn’t necessarily meet the needs of the participants. There is a hidden danger in progressive projects which are sometimes designed to attract participants and promote the work of the company or facilitator organising them, and not to serve the needs of the participants. It’s a blessing that so many artists and organisations are using art in healthcare settings but most of the time there are no assessments of the individuals’ needs or an evaluation of these projects. We keep proving success by showing pictures with older people laughing while they are holding a puppet or a brush. If the camera lens is focused on a happy older lady doing yoga, then out of frame is likely to be an older man with advanced dementia, who is asleep on an armchair. Does this make this activity successful? 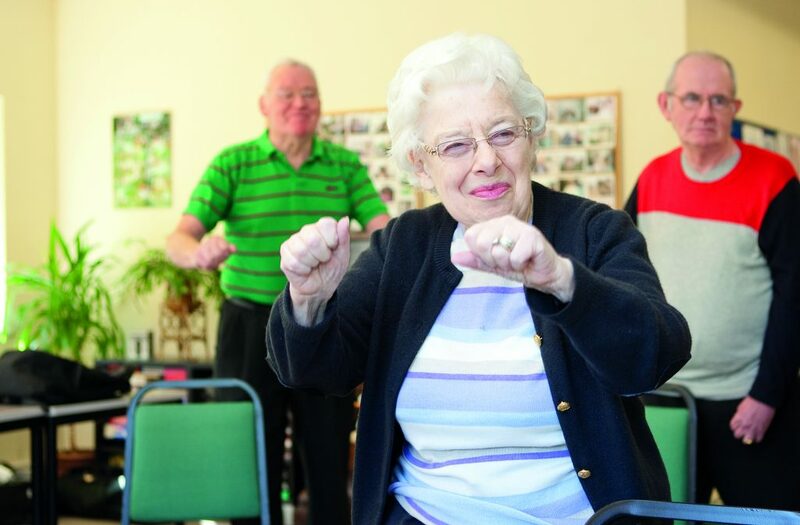 Can we consider activities to be successful if they exclude some residents of the care home? It feels like most of the organisations that serve older and disabled people are trying to fill the gaps in the programme of activities. On the other hand, most of the time, they don’t take into consideration the wide range of needs of their clients. We have a duty to create bespoke strategies that meet the needs of each specific group of older and disabled people. Then we need to make sure that we measure the wellbeing impact of the art activities. Art should be used as a tool to transform people’s lives. The aim is to involve people in the creative process and not to push people to produce art products. Mayra Stergiou, a Theatre Maker, Drama Therapist and director of Vetrebra Theatre Company worked hard over the years to understand the needs of residents and staff in care homes, social care groups and other organisations. The company runs many successful person-centered projects in collaboration with different organisations and theatres in the UK and abroad. The beginning of Vertebra’s journey started by organising puppetry and drama therapy workshops in care homes and healthcare organisations, and Mayra’s approach was different from the outset. Apart from keeping the balance between the therapeutic and creative aspect of each project, she used the very first sessions to understand the specific needs of each group in order to create art projects tailored to meet the needs of each member of the group. Apart from organising workshops, Vertebra produced Dark Matter, a puppetry show that was sold out in Edinburgh Festival last summer which created awareness around dementia and end of life and managed to engage health professionals, family members and friends of people who live with dementia. “This is my life!”, a carer said in tears at the end of the performance in Greenside Venues. “I never expected a theatre performance will help me cope with death and loss”, an audience member said after the last show at Little Angel Theatre as part of the Creativity and Wellbeing week. Mayra Stergiou also organised a large puppetry theatre performance inspired by Romeo and Juliet and stop motion animation and puppetry workshops for older people. These projects were designed by taking into consideration the participants’ needs, and were repeatedly updated as the aim of Vertebra Theatre is to constantly evaluate projects and the needs of each participant. Art is a great way to improve people’s lives and the role of the facilitator is to let the participant lead the workshop and adapt their programme accordingly.